My family and I started to become a part of the “Green Movement” by recycling, watching our energy usage (yes with kids you are always monitoring their light switching abilities! ), and making our own cleaning products. Like any parent, you always worry about your small Children getting into the cleaning cabinet or “how much bleach can my nose and brain handle?” while we are hands and knees scrubbing the bathroom. These are simple recipes that I use, and now I feel comfortable with my kids using them because I know I won’t have to call poison control if they accidentally spray themselves:). 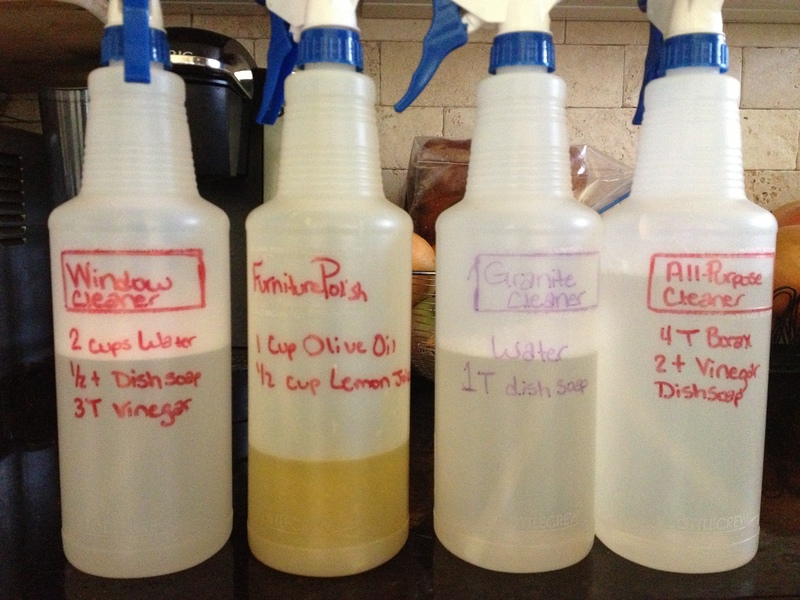 What making yor own cleaning products also does for you is it totally saves you money! The Ingredients are similar, cheap, and you always have tons left over for future refills. Good rule of thumb: Buy empty spray bottles when at the store ($.97-$3) because as a homesteader, they always come in handy and are reusable! I use the first one, but have used the second one. Both work great! I also use this on my stainless steel appliances. You can use a mason jar or spray bottle, really just a personal preference. Spray and wipe, newspaper is useful here too.